All directory websites generate leads from visitors who contact professional members. This add-on allows your site to instantly send leads to members without you manually matching them. This means members will automatically be connected with leads and have the ability to purchase them in real-time. You’ll generate more revenue from your website leads than ever before! 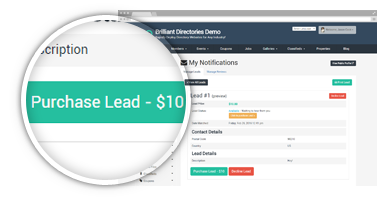 The Automatic Lead Matching add-on is for customers that are ready to generate revenue and have an influx of leads directed to your website. If you are just getting started with your website, we recommend holding off on adding the Automatic Lead Matching add-on as it is a solution that your business will grow into. QUESTION 1: Does your website drive visitors to fill out a “Get a Quote”, “Ask a Question”, or “Get Matched” form? With Auto-Matching, each inquiry will instantly get matched to members that meet a specifically defined parameter. QUESTION 2: Does your website receive weekly leads? With each lead taking up to twenty minutes to fulfill from start to finish (including following up via email during and after the lead is sent to your members), this add-on instantly pays for itself. QUESTION 3: Want to ensure that your members receive notifications in real-time when they are matched with a new lead? This add-on includes built-in settings to integrate your website with services like TextMagic. TextMagic makes it possible to automatically send SMS (text message) notifications to your members as soon as they are matched with a lead.